Never one to let common sense (or gravity) get in the way of a good visual or ambitious idea, Kanye West kicked off his Saint Pablo tour last night by literally rising above his haters, and also everybody else. Debuting the new tour—in support of his long-hyped The Life Of Pablo, released earlier this year—at Bankers Life Fieldhouse in Indianapolis, West channeled his own inner Keith Emerson, playing the entire show from atop a floating platform that roamed the NBA stadium according to his whims. 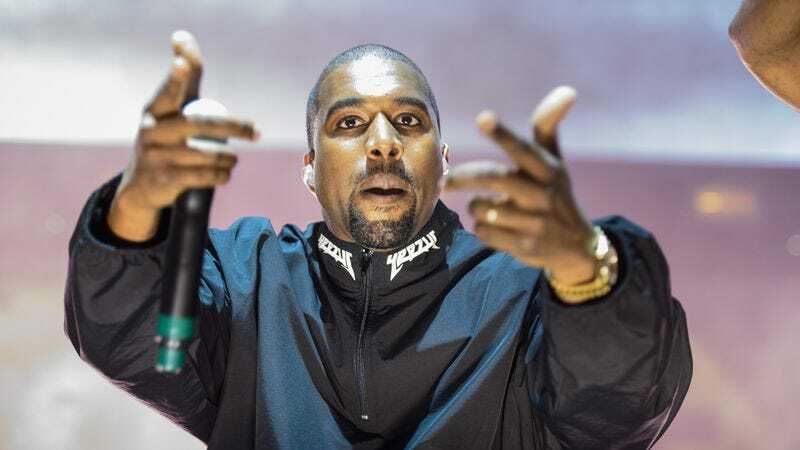 By all accounts, it was a pretty raucous show, with West drifting back and forth, bathing his audience in his ultralight beam, and basically acting like some sort of mercurial rap god. (He occasionally took the opportunity of his elevated vantage to chastise concert security, or direct them toward fans that were getting crowded too badly in the free-flowing mosh pit that formed beneath his hovering throne.) And, never one to let a pulpit go to waste, he also took time out of his show to address his many detractors: “I know they call me crazy sometimes,” he said, from atop his magical flying platform. “I just call them lazy all the time.” Honestly, we can kind of see both sides.